An earthquake of moderate intensity (4.9) in the Richter scale which rocked Assam at around 10-30 am on Monday has caused severe damage to a school building constructed from Rastriya Madhyamik Siksha Abhiyan (RMSA) fund and under the technical supervision of state PWD, Building Department. 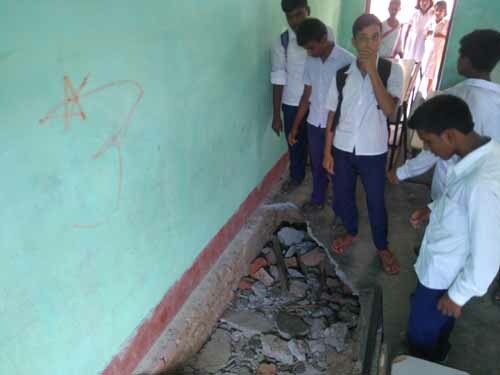 The incident occurred in the classroom of Mangaldai Vidyapith, a high school located at ward no-6 of Mangaldai town when a sizeable portion of the concrete floor on the southern most part of the room suddenly collapsed following the jolt. A couple of students were injured in the incident. A boy of class VIII standard who was sitting on the bench while attending English class fell down when the floor collapsed. The injured were immediately given first aid by the school authority before doctor’s advice. Officials of different relevant government agencies including Inspector of Schools Darrang Nagen Boro, Project Engineer, RMSA, Darrang, Dhrubajyoti Nath have rushed to the school to assess the situation. Meanwhile talking to the North East Now, Project Engineer, RMSA, Nath informed that the class room with a size of 8 metres by 6.5 metres was constructed along with three other rooms of same size in the year 2015-16 under the technical supervision of PWD (Building), Mangaldai Sub Division. The RMSA sanctioned an amount of Rs 21.89 lakhs for the work, however surprisingly work was allotted to the contractor at around Rs 16.76 lakh nearly twenty four percent below the sanctioned amount . Project Engineer Nath has not ruled out the possibility of collapse of the remaining portion of the floor of the room. Meanwhile Head Mistress of the school Munmuni Dutta has decided to keep the room under lock and key until the reconstruction of the floor to avoid any possible risk for the students. The incident has clearly brought the quality of work of all the school buildings constructed in recent times from the RMSA fund in the district under scanner.